"Nothing Else in Europe Can Compete with It"
His research took him to Alaska, but the prestigious ERC grant brought Guido Grosse back to Europe. In this interview, the geologist explains how research into permafrost can even be conducted from Potsdam. Mr Grosse, grants from the European Research Council are highly coveted. Do you remember the moment you received the invitation to interview? I was about to head out for fieldwork on my snowmobile in northern Alaska. I finished this work earlier and turned up for the interview wind-chapped and sunburnt. I had prepared mostly on the basis of online training materials – I couldn’t exactly fly back to Europe from the US for coaching sessions. How do you persuade people in such an important meeting? You need to be enthusiastic about your project, make it plain that this is a great project idea and convince the panel that you really are able to pull it off and mange the remaining risks. I investigate permafrost, i.e. soils that are permanently frozen. These soils store large amounts of carbon originating from plant and animal remains, about twice as much carbon as is present in the atmosphere. Climate change is causing some of these areas to thaw rapidly, mobilising the carbon that has been stored in them for thousands of years. The result is a release of greenhouse gases like CO2 and methane into the atmosphere. This is widely known – what is uncertain is the extent to which it is happening. The questions we ask in our project are therefore: Which areas are particularly susceptible to thawing? And how much carbon is affected? How will you go about answering all these questions? 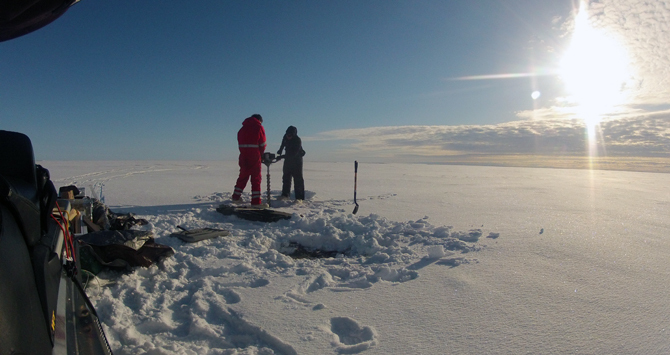 We intend to measure the amount and distribution of carbon in the soils in Siberia and Alaska and study thawing processes. Then we will apply the results to larger areas using remote sensing. Time series of satellite images will show us how the landscape changes, including how fast the soil is thawing, e.g. around lakes. This will enable us to create predictive models at a later stage. I studied geology, and for my diploma thesis I did some fieldwork in the Arctic, which I found so interesting that I wanted to continue working on the topic. And that’s just what I’ve been doing since finishing my doctoral degree at the University of Potsdam and the Alfred Wegener Institute, Helmholtz Centre for Polar and Marine Research (AWI). In 2014 you returned to the AWI after a number of years in the US. That’s right. After finishing my PhD I asked myself: where are the experts, where can I learn the most in a short period of time and where can permafrost be found? The University of Alaska was the perfect environment in which to continue my academic career. While in Alaska I managed to get published, secure funding for projects and establish myself as an assistant professor. I wanted to establish my own independent group and improve remote sensing methods. This works much better with solid long-term funding. After nearly seven years in the US, I applied for an ERC grant in autumn 2012 – with the possibility of returning to Europe and the AWI in mind. I had maintained all my old contacts while in the US. An ERC project is no walk in the park. At what point would you say someone is ready to submit an application? Good question! I applied for a Starting Grant just in the nick of time. A little later, and I would have been competing for a Consolidator Grant instead. One of my advantages was certainly my several years of US research experience, which meant I had good publications, project leadership and international partnerships on my record. However, some people even manage to get the grant soon after finishing their PhDs. How do you prepare an application like this? I worked closely with former colleagues from the AWI and the centre’s EU funding specialists. Particularly for fieldwork outside of Europe, there are a lot of administrative factors to bear in mind that need careful planning. What does the ERC grant mean for you? Scientific independence! It offers a fantastic opportunity to build up a group of my own over an extended period of time and conduct independent research at this relatively early stage in my career. Nothing else in Europe can compete with that. Could you have done it without the grant? Given how important the project is to me, I would have tried to finance it without the ERC, though on a different scale. As to whether I would nonetheless have returned to Europe, who knows? So far, I’m glad I did – although Germany did take some getting used to after such a long time abroad. It was great to have colleagues at the AWI who helped smooth this transition.